The Union Minister for Textiles and Information & Broadcasting, Smt. Smriti Irani addressing the gathering, at the inauguration of the 44th edition of India Handicrafts and Gifts Fair Autumn 2017, at Greater Noida, in Uttar Pradesh on October 12, 2017. Delhi: The Union Textiles Minister Smt. 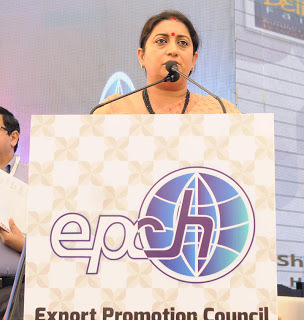 Smriti Zubin Irani has urged the exporting fraternity to take care of the welfare of artisans who are the backbone of the sector. The Minister said that design and product development play a crucial role in value realisation and in turn in the benefit that the artisans and producers are able to reap from their products. The Minister said this after inaugurating IHGF – Delhi Fair Autumn 2017, world’s largest handicrafts and gifts fair. The fair is being held at India Expo Centre & Mart, Greater Noida, during October 12 – 16, 2017. Delivering the inaugural address, the Minister applauded the role of Export Promotion Council for Handicrafts in promoting exports of handicrafts. She noted that handicraft exports have witnessed a year-on-year growth of 13.15% in 2016-17 and has touched Rs. 24,392 crores. The Minister appreciated the launch of schemes by EPCH under their CSR programme, for education of children of artisans. The scheme provides full support to education of children of artisans through open schools. 75% of the expenditure will be borne by EPCH and 25% by member exporters. Smt. Irani added that it is the dream of the Hon’ble Prime Minister that no child in the country should be left illiterate. The Minister appreciated the introduction of “Design Register” scheme by EPCH, which allows hassle-free registration of designs by member exporters. She said that EPCH design services will definitely help the sector in a big way and will augment the exports of handicrafts from the country, ultimately increasing employment opportunities to artisans. The Textiles Minister expressed her satisfaction that the vision of the Hon’ble Prime Minister to promote the North East is being effectively implemented by EPCH. EPCH has an integrated programme of development of NER handicrafts and handlooms, under which support is provided for design, marketing and skill development. The Minister also noted that for the first time for handicrafts sector, an initiative is being taken to promote Foreign Direct Investment and opportunities for Joint Ventures for both exporters and importers. A symposium on “Investment Opportunities in Handicrafts Sector” is being organised. This initiative will give opportunities for overseas buyers to bring technical know-how, investment and marketing networks to form joint ventures for promoting Indian handicrafts in the world market. 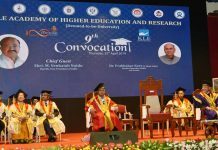 Speaking on the occasion, Chairman, EPCH, Shri O.P. Prahladka spoke of EPCH’s vision for the next five years on technology upgradation. He said EPCH has just started the “Design and Product Development Technology Mission”. Shri Prahladka also appreciated the support received from Ministry of Textiles and Ministry of Commerce for the smooth implementation of GST.